After a meticulous, comprehensive fertility diagnosis, we implement a customized treatment plan, along the way, delivering the MOST compassionate care available. Incredible Success Rates with a Personal, Boutique Touch. 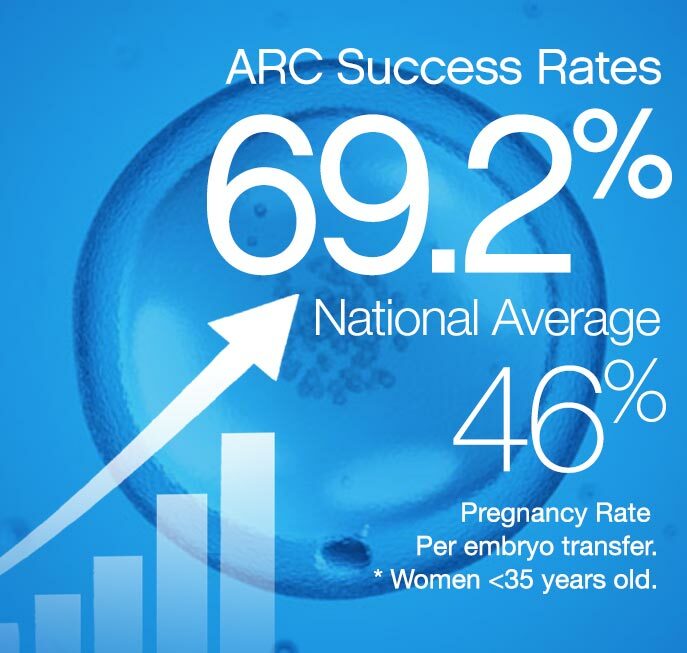 Our high success rates are a result of our patient-centered approach, that combines compassionate care with individualized attention to give you the greatest chance of achieving your fertility goals. We consider it our privilege to offer the most high-quality, cutting-edge fertility services to everyone trying to conceive, or preserve their future fertility. We owe our success to putting our entire focus on YOU, and reaching your fertility goals. Trouble conceiving? Looking for “The Best Fertility Clinic”? You just found it. Now, your next step…. Having trouble getting pregnant or looking to ensure future fertility? Either way, you’ve found the right place. Call us today or fill out the form below. Honesty is the cornerstone of Advanced Reproductive Center. We are upfront with our fees. We don’t believe in hidden fees or adding on expensive extras with little to no reason. Everyone should have an opportunity to have a child. We want to help make this happen. • Money back guarantee plans (See our IVF prices page). • We also offer convenient financing options. Success through kindness, precision, efficiency. • In depth factual information and education for every client. • In vitro fertilization (IVF), and IVF with Egg Donation or Surrogacy. At the end of the day, executing the strategy we create for your needs, and achieving your fertility goals is our measuring stick. The Information and Disinformation Around The Topic of Fertility Can Be Overwhelming. Advanced Reproductive Center Can Help Steer You Towards the Facts. Our success rates surpass the national average, by far. Start your family, at a time that works for you! Keep costs down while achieving your fertility goals. Save some time, Fill out the paperwork today! We act, listen & speak with honesty & kindness. Why Wait? Contact Us! We can’t wait to help! “I don't think I could have picked a better doctor." …From our first consultation to the day of our release to our OB, we felt taken care of, heard and respected. In a time of uncertainty, Dr.Deutch and his team always had our best interest in mind. We never felt rushed or pressured to do anything, but we always felt informed and free to make our own decisions, and always felt like we were given all the information, as well as, Dr. D's professional opinion. Everyone at the office learned our names and we were always greeted and taken care of with big smiles and positive attitudes. One person in particular we grew very close to was (nurse) Kelly. Had it not been for her, I would have probably gone off the deep end. I am a worrier by nature and Kelly always answered (all, I mean I had TONS of) questions. I never felt judged or that I was annoying her when I called for the 3rd time in one day! What a blessing she was. "I still can not believe how amazing Dr. Deutsch, his nurses and staff have all been! They are hands down the sweetest, most compassionate healthcare professionals I have ever met. Their support has helped keep us positive and has made this process less stressful."